First off...this is not a Resolution Post, not a Bucket List, not a Challenge List, not a 'I Swear on a Stack of Bibles' oath, but more like a 'Wishful Thinking/I Can Do It' Plan. Yes, I know I have a history of 'OverDoingIt', and I very well may follow in my 2014 Footsteps here in the New Year. I may have to step up my Multi-Tasking Skills to accomplish this WT/CanDo Plan, and set aside a couple of 'Collection De-Stashing' goals along with 'Household Chores'...no problem with the chores. With the announcement of Genealogy Addiction Break Nearly Over that pretty much put Tracks of My Georgia Ancestors at the Top of the WT/CanDo Plan. 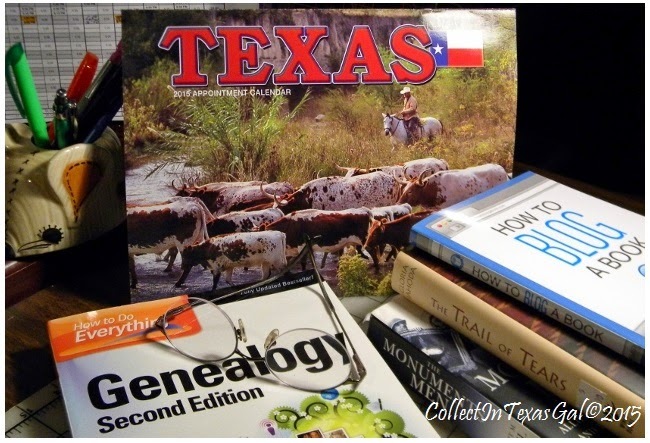 It's off to a good start with the introduction of 52 Ancestors Weeks Challenge hosted by No Story Too Small. A Post of Firsts and Fresh Starts is a story that begins with an ending in a cemetery that leads to a 'Fresh Start' for a family tree member that was lost. Oddly enough her fresh beginning research began with an ending in yet another cemetery. Then there's CollectInTexas Gal. The HUB of my 'Blog Wheel'. The plan is to not add any more spokes, but to keep what I have well oiled. 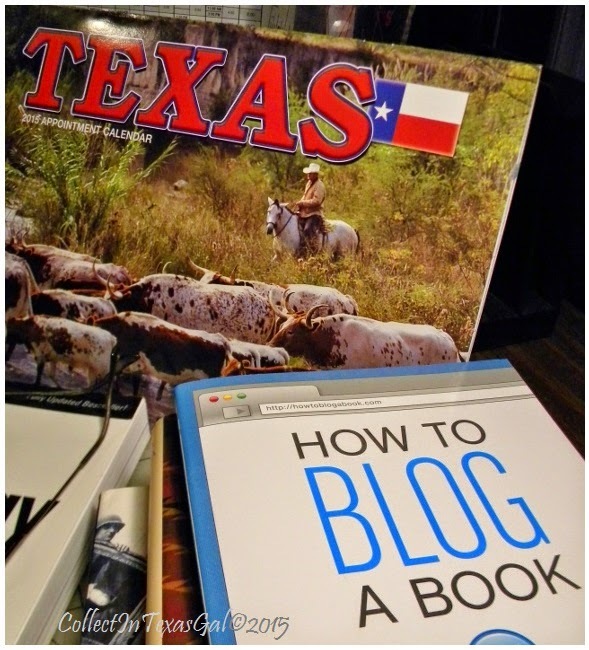 As you know if you have been a reader here for awhile, there is no shortage of Texas topics to blog about. I plan figure will try to 'StepItUpDaily'. Yikes, I can't believe I said that outloud! Like I said, this is not a resolution or an oath. Just sayin'. My saving grace is that we all know a 'Hub' speaks posts for the 'Spokes'. Several years ago, I invested in 'How To Blog A Book' with the idea that someday one might actually be published. I may come closer to that this year as an actual item to scratch off my genealogy bucket list. ..."I, Sandra Sue Pittman do swear, on a 'Stack of Family Bibles' to continue and maintain The Pittman-Carroll-Marley-Leatherwood Family Tree. I do promise to prove that Rene Marion Pittman came to America from France and Mary Josephine Leatherwood descended from a Great Apache Chief." I kept my promise and in the process wiped out no telling how many years of Aunt Irene's research. Rene Marion Pittman, Irene's great grandfather was born, raised and died in Cobb County, Georgia, USA. The only thing remotely French was his name Rene which came from his maternal Scottish ancestor who may or may not have traveled to France during the Crusades. Then to further burst her bubble and mine, her great grandmother Josephine was born, raised and died in Texas as a Civil War Soldier's daughter and a Cotton Farmers Wife. Dear Aunt Irene, I thought you'd like to know the reason we can't seem to get the hang of speaking French, and why the thought of buckskin makes us itch. Hope you are not too disappointed! I'm already thinking I need a bigger plate and full salt shaker. I may have to, too...even if my balanced world is usually off kilter anyway. HA -- following your example, I might one day be able to prove our family actually did own the Natural Bridge (in Rockbridge County, VA) or that we didn't. Have fun in 2015. Sue may I say, you just make me smile? Thanks for all these wonderful shares.